The 16th edition of Neighbours' Day was an International success and since its launch in Paris in 1999, the festival continues to rise and in fact it has far exceeded the European borders. The party is now celebrated around the world by millions of people – 1450 partner cities, housing organizations and associations are participating in over 49 countries with more than 30 million participants! The impressive development of Neighbours' Day is living proof that the desire to promote a "better living together" has no borders! 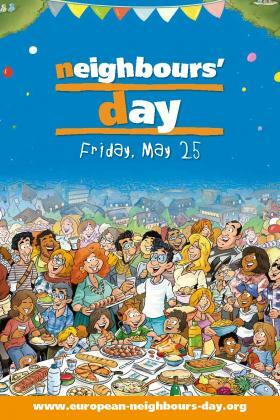 Each year, Neighbours' Day keeps growing with new partners. The celebration is the opportunity to reconnect with the values of solidarity, conviviality and friendship that should be at the forefront of neighbourly relations. This year, the European Neighbours’ Day is celebrating its tenth anniversary in Strasbourg! I am very pleased with the extent this event has taken, and I hope with all my heart it will last all year long with solidarity gestures. Little daily favours can become real solidarity streams! The 2017 European Neighbours’ Day edition is placed under the high patronage of the European Parliament. “Your initiative glorifies solidarity as a fundamental value shared with the European people through local activities, which strengthens social bounds and supports active integration of citizens. It is really appreciated by the European Parliament.